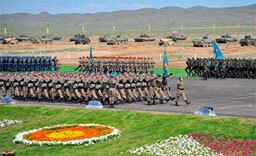 ASTANA (Kazinform) – President Nazarbayev presided over 1st military parade in the history of Kazakhstan which took place took place at Otar military base today. The Commander-in-Chief, President Nazarbayev, stated: “We will continue to acquire new technique and equipment for the armed forces of Kazakhstan.” The Head of State also mentioned new technologies that are being introduced in order to boost effectiveness of combat training. He also reminded of the new law on military service and status of military men adopted last year. During the ceremony, Nazarbayev promoted Chairperson of the Committee for Legal Statistics and Special Recordkeeping of Kazakhstan Prosecutor General’s Office Saule Aitpayeva to the rank of general on Monday, said Interfax-Kazakhstan. Saule Aitpayeva has been heading the Committee since April 2012. She has become the first female general since Kazakhstan gained independence. As reported, Nazarbayev decorated a group of military servicemen and employees from law enforcement agencies with state awards in the run-up to the Defenders’ Day.